You may think you can only have excellent creme brulee when you visit a nice restaurant, but that’s not true! Try our simple vanilla creme brulee recipe at home so you can have this delectable dessert whenever you crave it. Creme brulee is a surprisingly easy-to-make dessert with only a few ingredients. Even though it is so simple to make, it’s many people’s favorite dessert. This is the perfect sweet treat to prepare for a special occasion, like an anniversary. You could also serve it as dessert when you invite friends over for dinner. They’ll be amazed that you know how to make creme brulee at home! 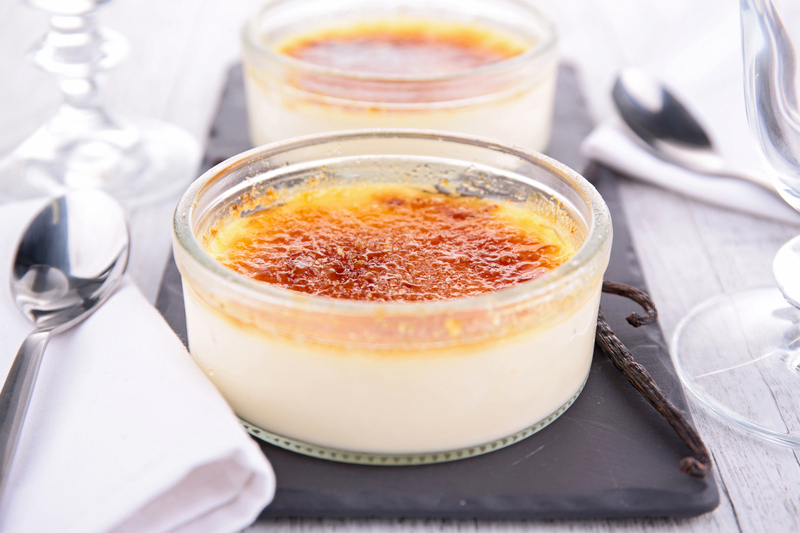 If you’re thinking about making homemade vanilla creme brulee, look at our recipe below! Add the heavy cream and vanilla extract to a saucepan and bring it to a boil over medium-high heat. After it boils, remove it from the heat and set it aside. Boil a small amount of water to use later for baking. In a separate bowl, combine the egg yolks and a 1/2 cup of sugar. Whisk them together until they are well blended. Slowly add the cream to the egg and sugar mixture, whisking continuously. Once all the cream has been added and the mixture is smooth, pour it evenly among six 7- or 8-ounce ramekins. Place the ramekins into a 9x13x2″ baking dish. Fill the baking dish halfway with the boiling water. Bake the creme brulee about 45 minutes. You will know they’re done when the creme brulee is set but the centers still wiggle a little bit. Remove the ramekins from the baking dish and let them cool off. Once they’re cooled, refrigerate the creme brulee for at least two or three hours. You may keep them in the refrigerator for up to several days. When you’re ready to serve the creme brulee, take them out of the refrigerator at least 30 minutes before browning the sugar. Add 1 teaspoon of sugar as a thin layer on top of each creme brulee. Use a torch to brown the sugar to form the crisp top. If you don’t have a torch, you can still brown the sugar. Place a rack in your oven, so the ramekins are about 2 or 3 inches from the top. Turn on the oven to low heat and let them cook until the sugar forms the hard crust on top. It should take about five minutes for the crust to form. Let the creme brulee sit about five minutes after melting the sugar. Serve. When you’re learning how to make creme brulee at home, make sure you’re using Sauder Eggs. We partner with farmers who are dedicated to bringing you and your family the freshest and highest-quality eggs. Use our store locator today to find a store that stocks Sauder Eggs nearest you.